Once we are attached, I try to use the notify on exception but you can also choose to break on exception. The -p switch will print out all the stack including method parameters. You can then use !do to dump the parameter. We will review the WinDbg Extension SOS.dll in .NET Framework 4.0 CTP. CLR 4.0 has renamed runtime dll from mscorwks.dll to CLR.DLL, that’s really helpful. 1. DML Support – YES, finally. SOS supports DML in .NET 1.1 but it was gone in clr 2.0. 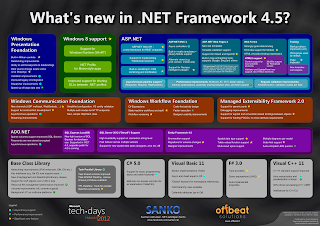 Silverlight CoreCLR supports DML and now .NET framework 4.0 supports it as well. For people new to WinDbg, Why am I so excited about DML support in SOS? If you look at the above snapshot, you have the link for each MethodTable address which you can just click on to execute the command. No need to type, however not every commands will have the DML support but !dumpobject is another important one, you can just click on object address to dump an object from GC Heap. First column is your debugger thread id and the second column ID is ManagedThread ID, OSID column is OS thread ID so that means OSID column will be 0 or some garbage when a runtime uses Fiber. TS_DebugSuspendPending = 0×00000008, // Is the debugger suspending threads? TS_ThreadPoolThread = 0×00800000, // is this a threadpool thread? TS_TPWorkerThread = 0×01000000, // is this a threadpool worker thread? !findroots – This is a very powerful and interesting command, because it allows you to break into debugee when CLR garbage collect generational objects. The !Threads command outputs, among other things, the state of the thread. This is a bit field which corresponds to various states the thread is in. output of !Threads into !ThreadState. the valid portions of it. argument for signs of corruption. would need to reissue the command. CLR notification: GC – end of mark phase. generations too, and report those roots. GC heap that are not rooted anymore. The percentage column contains a breakout of free or unrooted bytes to total bytes. !GCWhere displays the location in the GC heap of the argument passed in. Heap local consistency not confirmed. the GC heap (in Server GC it displays OOM, if any, on each GC heap). OutOfMemoryException exception you can use the !PrintException command on it. To get the full callstack use the “kb” command in the debugger for that thread. For example, to display thread 3′s stack use ~3kb. in which case you will see JIT_New* on the call stack because managed code called new. instead of even trying to allocate it on the GC heap. be respected because it truly reflects what happened during GC. The other cases should be fairly obvious from the callstack. >> Where can I get the right version of SOS for my build? then you should replace “clr” with “coreclr”. isn’t loaded yet. What can I do? >> I got the following error message. Now what? Extension commands need clr.dll in order to have something to do. there will be a minimal managed environment for executing SOS commands. >> I have a partial memory minidump, and !DumpObj doesn’t work. Why? In order to run SOS commands, many CLR data structures need to be traversed. best way to debug a managed program at this level. >> What other tools can I use to find my bug? >> Does SOS support DML? it off and add /D to the beginning of a command to get DML based output for it. Not all SOS commands support DML output. an object through the GCs. root specified as the argument. of GC relocations that may have led to the address passed in as an argument. This command releases any resources used by the Hist-family of commands. invocationList and _invocationCount are both 0 indicating that this is a single delegate and no chain to follow. The real method is bound to the delegate instance. The other DWORD appears to be a metadata reference to the event owner itself. generated App_Code directory) and the name (DatabaseMonitor), gives me enough information to stop here and begin looking at the code itself.